(Christopher Mendez, London); purchased 2007 by NGA. 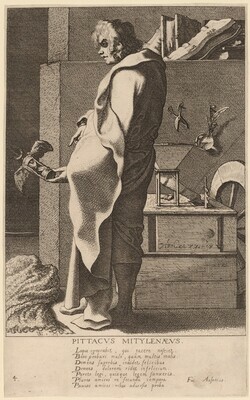 Medieval to Modern: Recent Acquisitions of Drawings, Prints, and Illustrated Books, National Gallery of Art, Washington, 2008, no. 54. The New Hollstein Dutch & Flemish Etchings, Engravings and Woodcuts, 1450-1700. (De Gheyn Family, Jan Piet Filedt Kok and Marjolein Leesberg, authors). Rotterdam: Sound & Vision Interactive, 1996-, "De Gheyn III," no. 6, state only.